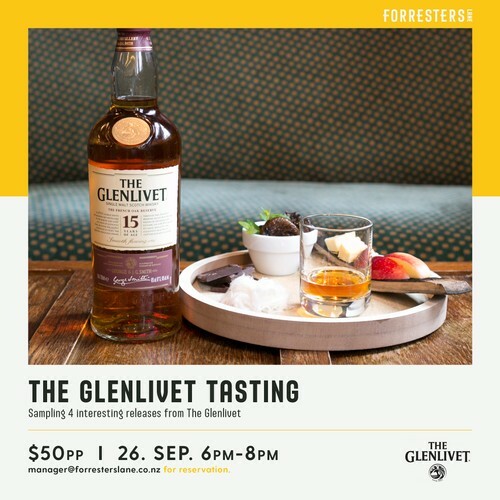 We are very excited to have David Wallace (The Glenlivet Brand Ambassador) and Forresters Lane shall co-host an evening sampling 4 interesting releases from The Glenlivet, some of which are new to our shores. In what will be a fun and informative evening, we will move through some of the finest drams The Glenlivet has in its range. We will hear about what makes these single malts so special and details will be shared around the craft of creating an iconic whisky with a focus on the influence of different casks. Glenlivets continual commitment to the traditional techniques results in a rich tapestry of flavours and history which explains why this malt is often referred to as ‘The whisky that defined a standard for Speyside Single Malts’. Across the evening you shall be provided with a welcome cocktail playing on the classic flavours of Speyside Malts followed by the tutored tasting. Whiskies shall be paired with a selection of nibbles inspired by the flavours from the casks chosen by Glenlivet to age their malts. Trust us, this is a unique whisky opportunity that you do not want to miss!